Download "ACT : INCOME TAX ACT NO. 58 OF 1962 SECTION : SECTION 24 SUBJECT : INSTALMENT CREDIT AGREEMENTS AND DEBTORS ALLOWANCE CONTENTS"
2 2 any other word or expression bears the meaning ascribed to it in the Act. 1. Purpose This Note provides guidance on the application and determination of the debtors allowance granted under section 24(2), as it applies to instalment credit agreements. 2. Background Section 24 has two main purposes. 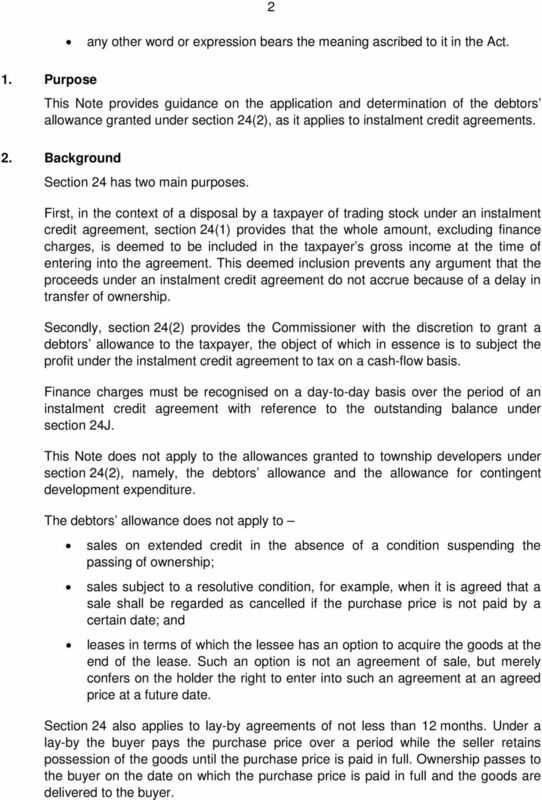 First, in the context of a disposal by a taxpayer of trading stock under an instalment credit agreement, section 24(1) provides that the whole amount, excluding finance charges, is deemed to be included in the taxpayer s gross income at the time of entering into the agreement. This deemed inclusion prevents any argument that the proceeds under an instalment credit agreement do not accrue because of a delay in transfer of ownership. 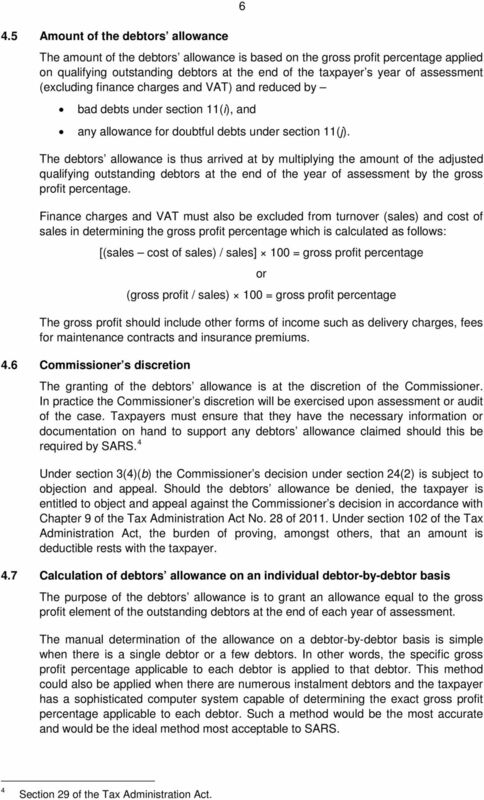 Secondly, section 24(2) provides the Commissioner with the discretion to grant a debtors allowance to the taxpayer, the object of which in essence is to subject the profit under the instalment credit agreement to tax on a cash-flow basis. Finance charges must be recognised on a day-to-day basis over the period of an instalment credit agreement with reference to the outstanding balance under section 24J. This Note does not apply to the allowances granted to township developers under section 24(2), namely, the debtors allowance and the allowance for contingent development expenditure. The debtors allowance does not apply to sales on extended credit in the absence of a condition suspending the passing of ownership; sales subject to a resolutive condition, for example, when it is agreed that a sale shall be regarded as cancelled if the purchase price is not paid by a certain date; and leases in terms of which the lessee has an option to acquire the goods at the end of the lease. Such an option is not an agreement of sale, but merely confers on the holder the right to enter into such an agreement at an agreed price at a future date. Section 24 also applies to lay-by agreements of not less than 12 months. Under a lay-by the buyer pays the purchase price over a period while the seller retains possession of the goods until the purchase price is paid in full. Ownership passes to the buyer on the date on which the purchase price is paid in full and the goods are delivered to the buyer. 3 3 3. 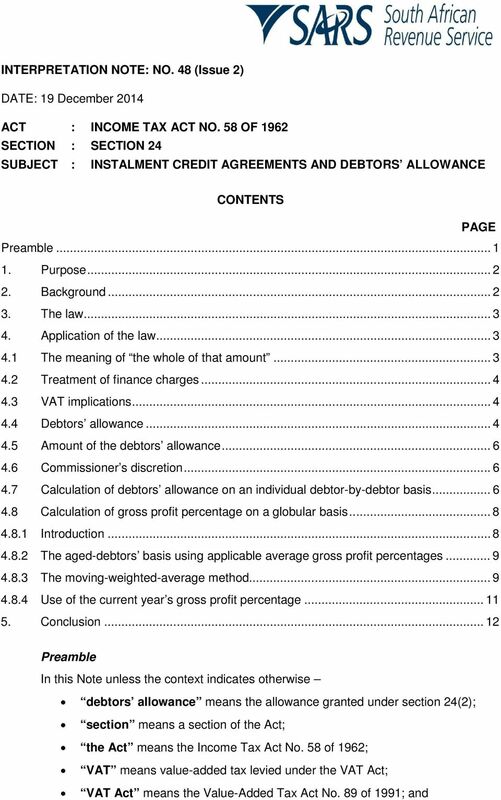 The law Section Credit agreements and debtors allowance. (1) Subject to the provisions of section 24J, if any taxpayer has entered into any agreement with any other person in respect of any property the effect of which is that, in the case of movable property, the ownership shall pass or, in the case of immovable property, transfer shall be passed from the taxpayer to that other person, upon or after the receipt by the taxpayer of the whole or a certain portion of the amount payable to the taxpayer under the agreement, the whole of that amount shall for the purposes of this Act be deemed to have accrued to the taxpayer on the day on which the agreement was entered into. (2) In the case of such an agreement in terms of which at least 25 per cent of the said amount payable only becomes due and payable on or after the expiry of a period of not less than 12 months after the date of the said agreement, the Commissioner, taking into consideration any allowance he has made under section 11(j), may make such further allowance as under the special circumstances of the trade of the taxpayer seems to him reasonable, in respect of all amounts which are deemed to have accrued under such agreements but which have not been received at the close of the taxpayer s accounting period: Provided that any allowance so made shall be included as income in the taxpayer s returns for the following year of assessment and shall form part of his income. 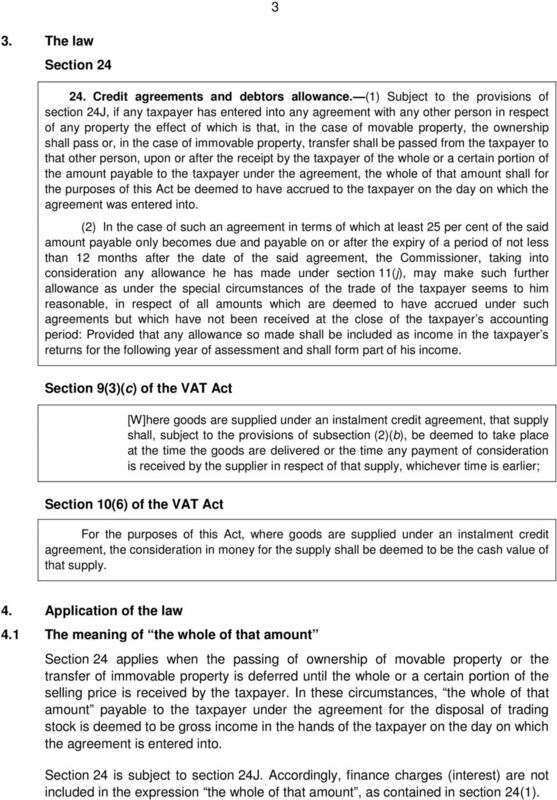 Section 9(3)(c) of the VAT Act [W]here goods are supplied under an instalment credit agreement, that supply shall, subject to the provisions of subsection (2)(b), be deemed to take place at the time the goods are delivered or the time any payment of consideration is received by the supplier in respect of that supply, whichever time is earlier; Section 10(6) of the VAT Act For the purposes of this Act, where goods are supplied under an instalment credit agreement, the consideration in money for the supply shall be deemed to be the cash value of that supply. 4. Application of the law 4.1 The meaning of the whole of that amount Section 24 applies when the passing of ownership of movable property or the transfer of immovable property is deferred until the whole or a certain portion of the selling price is received by the taxpayer. In these circumstances, the whole of that amount payable to the taxpayer under the agreement for the disposal of trading stock is deemed to be gross income in the hands of the taxpayer on the day on which the agreement is entered into. Section 24 is subject to section 24J. Accordingly, finance charges (interest) are not included in the expression the whole of that amount, as contained in section 24(1). 4 4 In CIR v Genn & Co (Pty) Ltd 1 Schreiner JA stated the following in relation to the definition of gross income : It certainly is not every obtaining of physical control over money or money s worth that constitutes a receipt for the purposes of these provisions. If, for instance, money is obtained and banked by someone as agent or trustee for another, the former has not received it as his income. At the same moment that the borrower is given possession he falls under an obligation to repay. What is borrowed does not become his, except in the sense, irrelevant for present purposes, that if what is borrowed is consumable there is in law a change of ownership in the actual things borrowed. Similarly, in Geldenhuys v CIR 2 Steyn J stated that the words received by as used in the definition of gross income must mean received by the taxpayer on his own behalf for his own benefit. VAT charged by a vendor (taxpayer) under section 7(1)(a) of the VAT Act for the supply of goods or services (so-called output tax as defined in section 1(1) of that Act), is not received by the taxpayer on the taxpayer s own behalf for the taxpayer s own benefit. When VAT is charged by a vendor there is an immediate obligation to pay the amount of the VAT so collected to SARS at a future date. 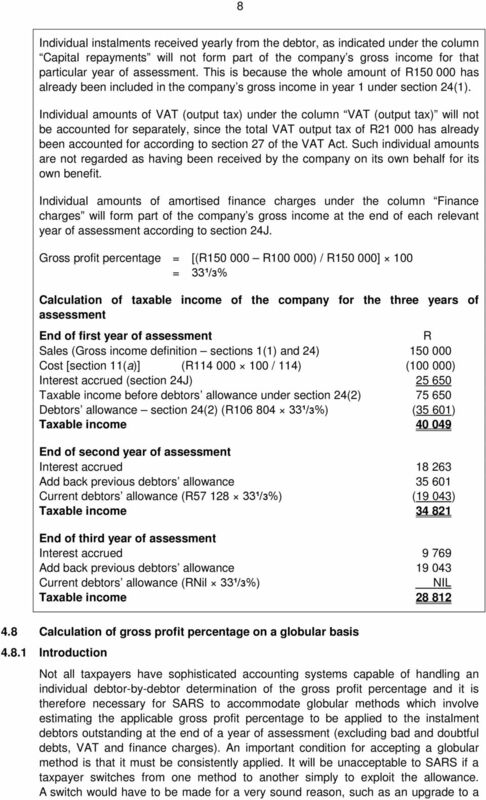 Such payment is effected by setting off any input tax or other allowable deductions and paying the balance to SARS. In these circumstances output tax does not form part of a taxpayer s gross income. 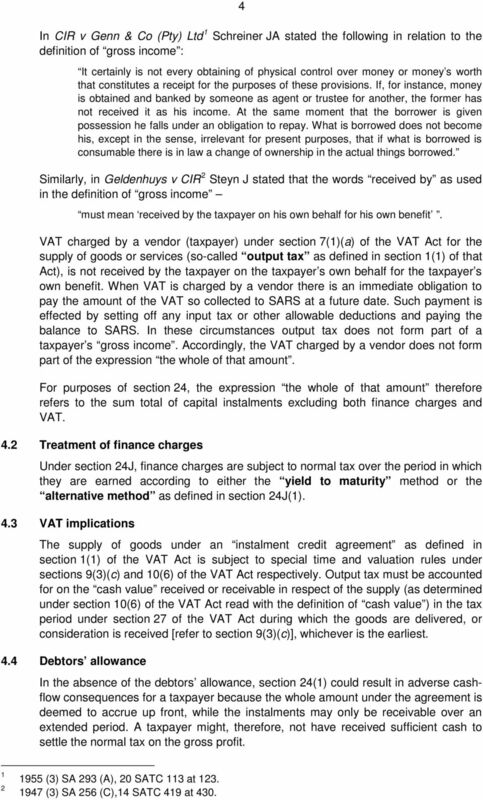 Accordingly, the VAT charged by a vendor does not form part of the expression the whole of that amount. For purposes of section 24, the expression the whole of that amount therefore refers to the sum total of capital instalments excluding both finance charges and VAT. 4.2 Treatment of finance charges Under section 24J, finance charges are subject to normal tax over the period in which they are earned according to either the yield to maturity method or the alternative method as defined in section 24J(1). 4.3 VAT implications The supply of goods under an instalment credit agreement as defined in section 1(1) of the VAT Act is subject to special time and valuation rules under sections 9(3)(c) and 10(6) of the VAT Act respectively. Output tax must be accounted for on the cash value received or receivable in respect of the supply (as determined under section 10(6) of the VAT Act read with the definition of cash value ) in the tax period under section 27 of the VAT Act during which the goods are delivered, or consideration is received [refer to section 9(3)(c)], whichever is the earliest. 4.4 Debtors allowance In the absence of the debtors allowance, section 24(1) could result in adverse cashflow consequences for a taxpayer because the whole amount under the agreement is deemed to accrue up front, while the instalments may only be receivable over an extended period. A taxpayer might, therefore, not have received sufficient cash to settle the normal tax on the gross profit (3) SA 293 (A), 20 SATC 113 at (3) SA 256 (C),14 SATC 419 at 430. 5 5 Under section 24(1) the debtors allowance is granted to taxpayers only in cases in which the passing of ownership of the property sold is subject to a suspensive condition, namely, payment of the whole or a certain portion of the selling price. In addition, section 24(2) provides that at least 25% of the whole of the amount under the agreement must be due and payable at least 12 months after conclusion of the agreement before the debtors allowance may be granted. For this purpose, any deposit payable is regarded as a payment of a portion of the selling price within the first 12 months. 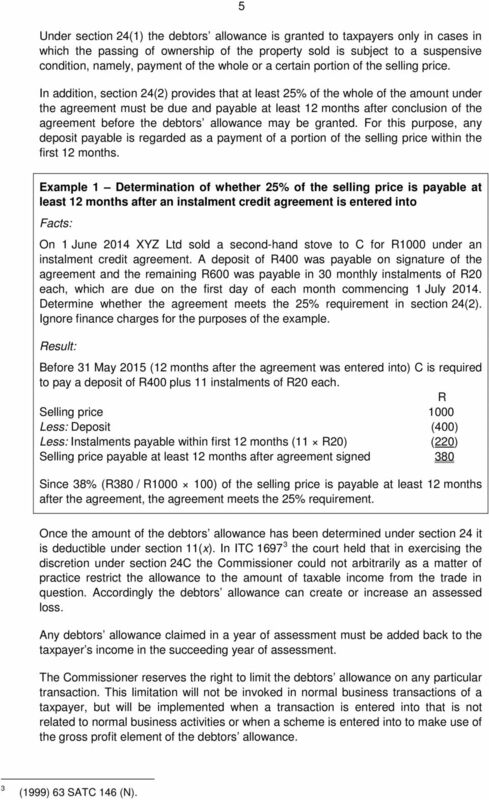 Example 1 Determination of whether 25% of the selling price is payable at least 12 months after an instalment credit agreement is entered into Facts: On 1 June 2014 XYZ Ltd sold a second-hand stove to C for R1000 under an instalment credit agreement. A deposit of R400 was payable on signature of the agreement and the remaining R600 was payable in 30 monthly instalments of R20 each, which are due on the first day of each month commencing 1 July Determine whether the agreement meets the 25% requirement in section 24(2). Ignore finance charges for the purposes of the example. Result: Before 31 May 2015 (12 months after the agreement was entered into) C is required to pay a deposit of R400 plus 11 instalments of R20 each. R Selling price 1000 Less: Deposit (400) Less: Instalments payable within first 12 months (11 R20) (220) Selling price payable at least 12 months after agreement signed 380 Since 38% (R380 / R ) of the selling price is payable at least 12 months after the agreement, the agreement meets the 25% requirement. Once the amount of the debtors allowance has been determined under section 24 it is deductible under section 11(x). In ITC the court held that in exercising the discretion under section 24C the Commissioner could not arbitrarily as a matter of practice restrict the allowance to the amount of taxable income from the trade in question. Accordingly the debtors allowance can create or increase an assessed loss. Any debtors allowance claimed in a year of assessment must be added back to the taxpayer s income in the succeeding year of assessment. The Commissioner reserves the right to limit the debtors allowance on any particular transaction. This limitation will not be invoked in normal business transactions of a taxpayer, but will be implemented when a transaction is entered into that is not related to normal business activities or when a scheme is entered into to make use of the gross profit element of the debtors allowance. 3 (1999) 63 SATC 146 (N). 6 4.5 Amount of the debtors allowance 6 The amount of the debtors allowance is based on the gross profit percentage applied on qualifying outstanding debtors at the end of the taxpayer s year of assessment (excluding finance charges and VAT) and reduced by bad debts under section 11(i), and any allowance for doubtful debts under section 11(j). The debtors allowance is thus arrived at by multiplying the amount of the adjusted qualifying outstanding debtors at the end of the year of assessment by the gross profit percentage. 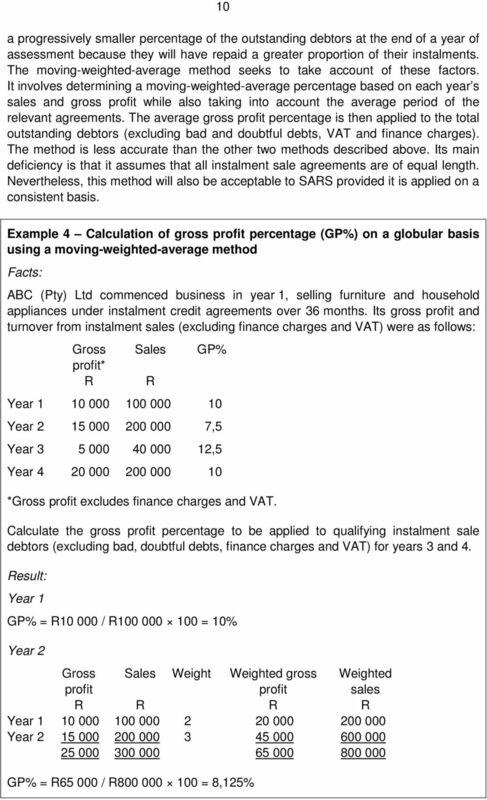 Finance charges and VAT must also be excluded from turnover (sales) and cost of sales in determining the gross profit percentage which is calculated as follows: [(sales cost of sales) / sales] 100 = gross profit percentage or (gross profit / sales) 100 = gross profit percentage The gross profit should include other forms of income such as delivery charges, fees for maintenance contracts and insurance premiums. 4.6 Commissioner s discretion The granting of the debtors allowance is at the discretion of the Commissioner. In practice the Commissioner s discretion will be exercised upon assessment or audit of the case. Taxpayers must ensure that they have the necessary information or documentation on hand to support any debtors allowance claimed should this be required by SARS. 4 Under section 3(4)(b) the Commissioner s decision under section 24(2) is subject to objection and appeal. Should the debtors allowance be denied, the taxpayer is entitled to object and appeal against the Commissioner s decision in accordance with Chapter 9 of the Tax Administration Act No. 28 of Under section 102 of the Tax Administration Act, the burden of proving, amongst others, that an amount is deductible rests with the taxpayer. 4.7 Calculation of debtors allowance on an individual debtor-by-debtor basis The purpose of the debtors allowance is to grant an allowance equal to the gross profit element of the outstanding debtors at the end of each year of assessment. The manual determination of the allowance on a debtor-by-debtor basis is simple when there is a single debtor or a few debtors. 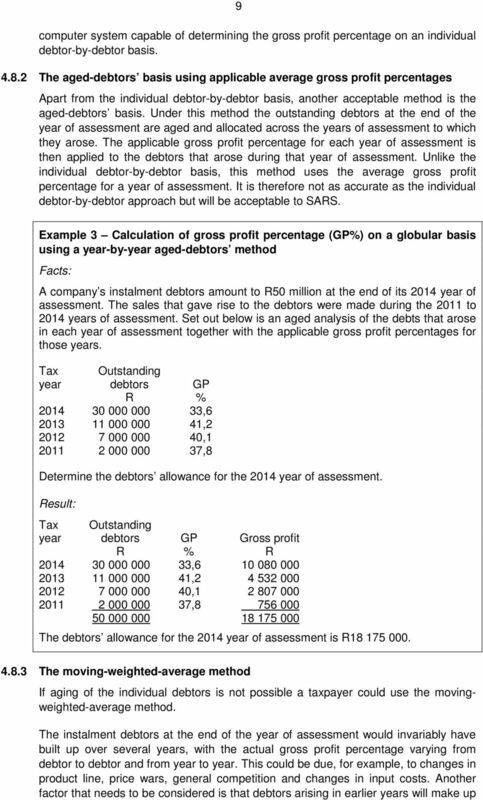 In other words, the specific gross profit percentage applicable to each debtor is applied to that debtor. This method could also be applied when there are numerous instalment debtors and the taxpayer has a sophisticated computer system capable of determining the exact gross profit percentage applicable to each debtor. Such a method would be the most accurate and would be the ideal method most acceptable to SARS. 4 Section 29 of the Tax Administration Act. 7 7 The example below illustrates the amortisation of finance charges and determination of the debtors allowance for a single debtor. 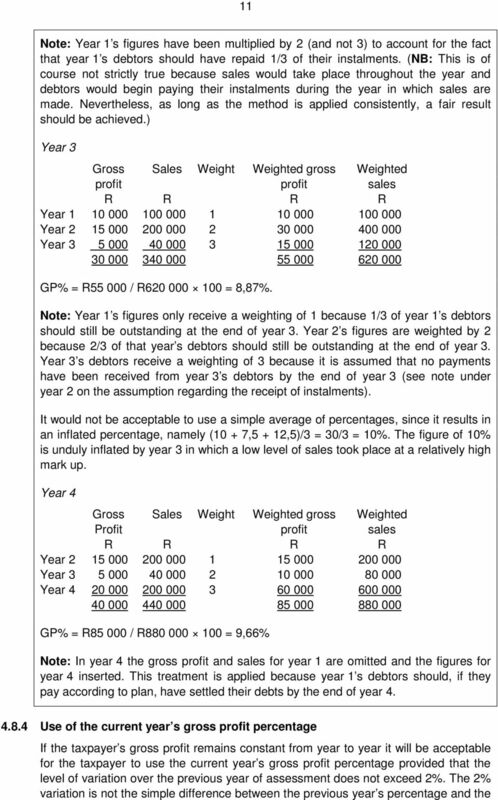 Example 2 Calculation of debtors allowance for a single debtor Facts: X Limited sold and delivered a machine held as trading stock which cost R (VAT inclusive) to its customer on day 1 of the first year of assessment under the following conditions: Selling Price Interest rate per annum 15% Payment period R (VAT inclusive) 3 years Instalment payments of R are received annually in arrears. 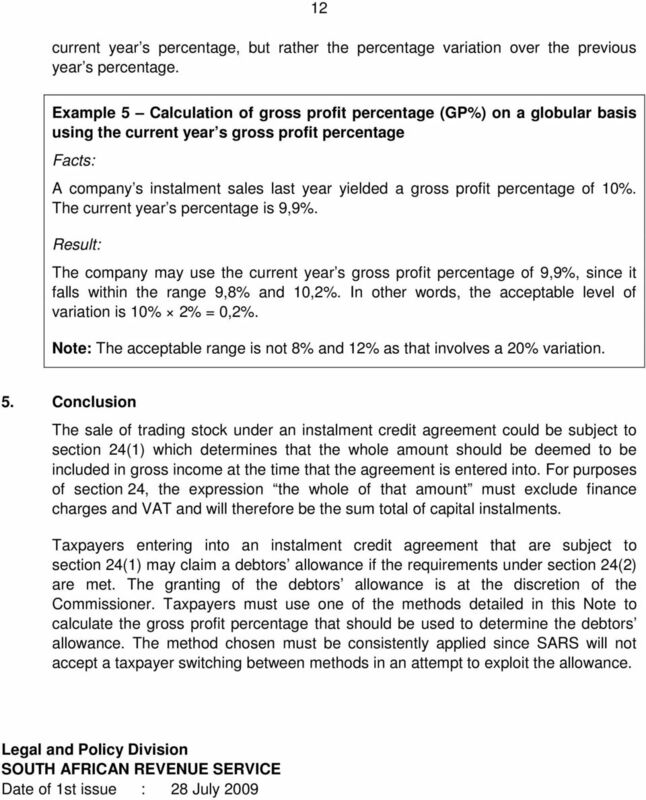 Result: The total of all capital instalments amounts to R (R ). 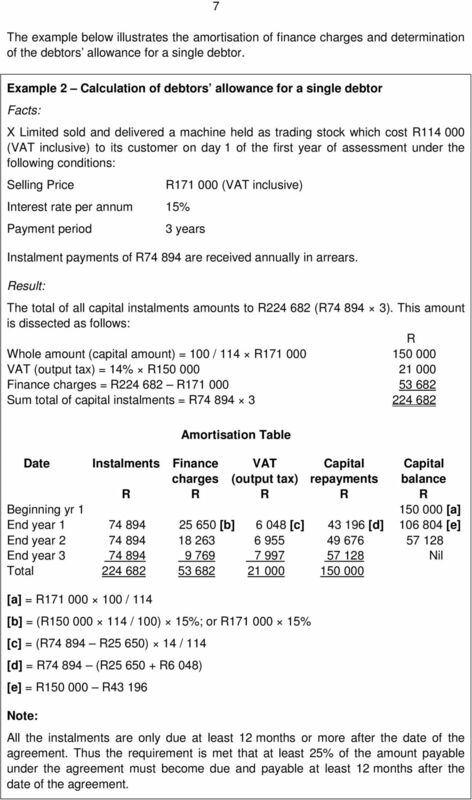 This amount is dissected as follows: R Whole amount (capital amount) = 100 / 114 R VAT (output tax) = 14% R Finance charges = R R Sum total of capital instalments = R Amortisation Table Date Instalments Finance VAT Capital Capital charges (output tax) repayments balance R R R R R Beginning yr [a] End year [b] [c] [d] [e] End year End year Nil Total [a] = R / 114 [b] = (R / 100) 15%; or R % [c] = (R R25 650) 14 / 114 [d] = R (R R6 048) [e] = R R Note: All the instalments are only due at least 12 months or more after the date of the agreement. Thus the requirement is met that at least 25% of the amount payable under the agreement must become due and payable at least 12 months after the date of the agreement. This is a Public Ruling made under section 91D of the Tax Administration Act 1994. TAX CARIBBEAN REGIONAL CAPACITY BUILDING WORKSHOP ON FACTORING / RECEIVABLES DISCOUNTING TAX IMPLICATIONS ON FACTORING RECEIVABLES By H.